Turahk's staff can create fear in an opponent, paralyzing him with terror or making him run away. Even the heroes of Mata Nui cannot resist the fear Turahk brings! Vorahk's staff can drain the energy of any foe - and add it to the might of this Rahkshi! Not even the powerful Onua Nuva can stand against him. 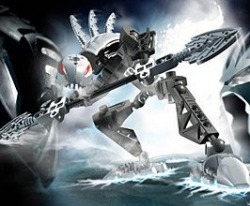 Kurahk is one of the most dangerous Rahkshi, for his power can turn the Toa Nuva against each other! His staff fills opponents with anger and makes them fight among themselves. 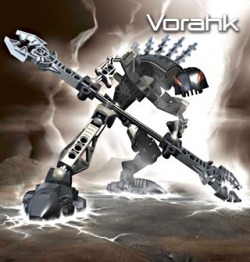 The Toa Nuva will need all their strength to resist the rage Kurahk creates! Panrahk's powerful staff can shatter any obstacle in his path. So great is his raw energy that the ground explodes wherever he walks! 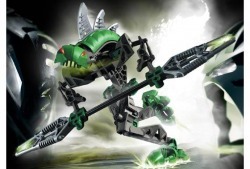 Can even the might of the Toa Nuva stop this power-packed menace? Lerahk uses his Staff of Power to spread poison. By ramming it into the ground, he can turn the soil toxic, and the merest scratch can infect an opponent. Guurahk's Staff of Power can cause objects to fragment and collapse into rubble. 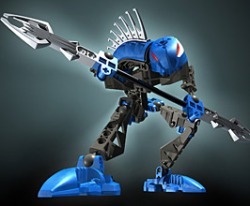 He will bring down the entire island of Mata Nui in his search for the Mask of Light, unless the Toa Nuva can stop him! 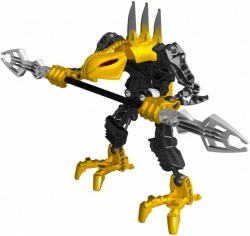 The bionicle stars set Rakshi, one of the last bionicle's for ever unless any other Lego company fail's in the future. 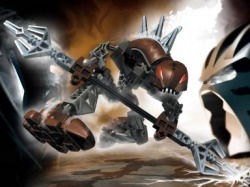 This Rakshi is got the power of a Toa acaionly because its got the staph of heat vision (same as you see on bionicle,com on Movies where Takanuva Vs Rakshi), these are a bit like Borhok because they attack in group's meaning they could be close to victory. do you think they will be?